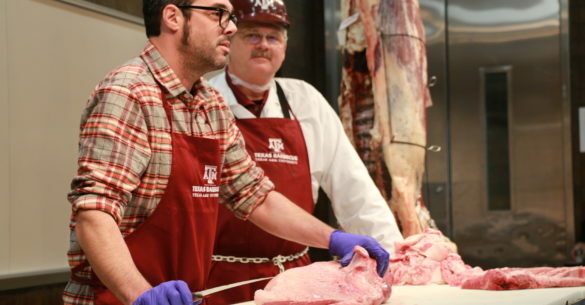 The fourth Camp Brisket, a joint venture between Foodways Texas and the Meat Science Section of the Department of Animal Science at Texas A&M University, was held on January 8-9, 2016 at the Rosenthal Meat Center and the Beef Cattle Center at the O.D. Butler Animal Science Complex. Participants from around the U.S. embarked on a journey to learn more about the ultimate challenge preparing that most difficult dish of Texas Barbecue cuisine, the brisket. 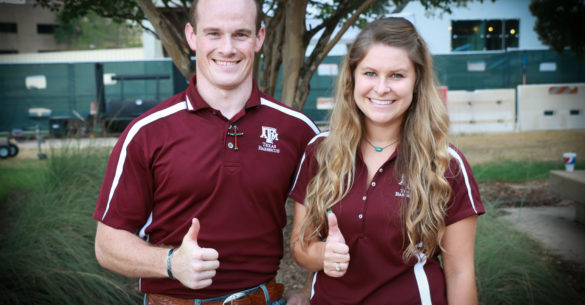 Camp Brisket was coordinated by Texas A&M University meat science educators, Davey Griffin, Ray Riley, and Jeff Savell, and who were assisted by graduate students, undergraduate students, staff, and friends and family including Courtney Boykin, Hillary Henderson, Hannah Laird, Crystal Waters, Mark Frenzel, Leslie Frenzel, Patrick Frenzel, Micki Gooch, Madalynn Kainer, Max Martinez, Marc Vogelsang, Kyle Phillips, Stormy Joplin, Taylor Rowland, Katy Jo Nickelson, and Jennifer Willis. These great folks ensured that the needs of the briskets and guests were attended to through the camp. The first talks were given by Robb Walsh, noted food and cookbook writer, on history of the use of briskets for Texas Barbecue, Jess Pryles, cook, writer, and TV personality, on the uses of brisket for competition barbecue and other dishes, and Davey Griffin, on the anatomy of a brisket. Proper knife use and sharpening was covered by Jeff Savell before a demonstration on trimming raw briskets and slicing cooked briskets was led by Aaron Franklin of Franklin Barbecue in Austin, Texas. The first tasting test we did was for different grades of brisket. We obtained five different grades/types of briskets for use in this demonstration: Prime, Certified Angus Beef, Wagyu, Choice, and Select. These briskets and the remaining ones used for the camp were trimmed to have no more than about 1/4 inch of fat remaining anywhere. Each brisket was seasoned with 3/4-cup of a half and half mixture (by volume) of Kosher salt and coarse-ground black pepper. The briskets for the grade/type demonstration were cooked on a Southern Pride pit on loan from Slovacek Sausage in Snook, Texas using oak logs as the source of smoke. Each grade/type of brisket was sliced so that each participant received a sample to rate on a ballot. When completed, the ballots were tabulated by the students to determine whether the participants could tell the difference in the grades or types of brisket. The winner? Prime, followed by Certified Angus Beef, with a tie between the Wagyu and Choice, and finally Select. The rankings each year we have conducted this taste test usually has the higher marbled briskets at or near the top, and the Select is always ranked last. There are perceivable differences in eating quality among different grades and types of briskets, and those interested in producing the best cooked briskets possible need to be aware of this. Davey Griffin and Ray Riley presented a beef grading demonstration featuring calling the factors on a beef carcass side in the classroom. USDA beef grading is a topic that many people have an interest in and love to learn about. This demonstration provided the backdrop for the discussion related to the findings of the brisket grades/type taste session at lunch. There was a Wood and Smoke panel at the end of the afternoon featuring Daniel Vaughn, Texas Monthly barbecue editor, as the moderator, Jeff Savell, Aaron Franklin, Kevin Kolman, Weber Grills, and Nick Nickelson. Post oak is the featured wood for Texas Barbecue based on its abundance and how the smoke complements beef. Nick Nickelson discussed the topic of using properly seasoned wood to smoke with and how important it was to getting a clean fire that imparts the good aspects of the smoke onto the product. The positives and negatives of the other woods most commonly used in smoking — hickory, mesquite, and pecan — were discussed. We moved to the Beef Center for the rest of the program. We were blessed to have two great people involved with dinner that night. Ronnie Killen of Killen’s Barbecue, Pearland, Texas, provided the main meal with his famous brisket and beef short ribs and sides. Homer Robertson, world champion chuck wagon competitor, provided bread pudding and peach cobbler for the crowd. The food was enjoyed by all! The next brisket comparison was to smoke briskets overnight using the four primary woods — oak, hickory, mesquite, and pecan. Multiple pits were used for the overnight cooking including one brought in from Aaron Franklin. We used Choice briskets, trimmed and seasoned as mentioned before, for the comparison, and briskets were put on the smokers around 10 pm on Friday evening so that they would be ready to serve around lunch time on Saturday. Kevin Kolman from Weber Grills started four Weber Smokey Mountain cookers with chunks from the four woods as part of the demonstration. The staff, students, and family tended to the pits overnight, which included a tornado warning, high winds, and rain around 1:30 AM. After seeking shelter for a time, everyone went back to work making sure the fires were just right throughout the night. After the rain and wind cleared out, Saturday morning became a time for a great chuck wagon breakfast of biscuits and gravy and breakfast tacos from Homer Robertson and friends, a primer on starting fires in off-set pits and Weber Smokey Mountain cookers, and a review of the different types of pits we used to cook with. A pit design and maintenance panel was composed of Aaron Franklin, Wayne Mueller, Louie Mueller Barbecue, Taylor, Texas, Arnis Robbins, Evie Mae’s Pit Barbecue, Wolfforth, Texas, Kevin Kolman, with Davey Griffin as the moderator. Each panelist added his own take on what types of pits/cookers they preferred and what they did to make sure they were used to their best ability. Jeff Savell spent some time going over different seasonings outside of the normal use of salt and pepper, and the science behind barbecue including the stall, Maillard Reaction, collagen solubility, smoke ring. He then fielded questions from the crowd regarding these subjects. Lunch that day was the tasting of the briskets prepared using the four different smokes — oak, hickory, mesquite, and pecan. Each participant received a small slice of brisket from each smoke and were asked to rate it on 9-point scales. Students tabulated the results, and the winner was oak, followed by hickory with pecan and mesquite tying for third. Each year either oak or hickory wins this competition. One of the most highly regarded parts of Camp Brisket is the final panel, which featured Russell Roegels, Roegels Barbecue, Houston, Bryan Bracewell, Southside Market and Barbeque, Elgin and Bastrop, Aaron Franklin, Franklin Barbecue, and Wayne Mueller, Louie Mueller Barbecue, Taylor. The title of the panel was “Life as a Pitmaster,” and it gave each person a time to reflect on their path to where they are now, the challenges and opportunities they each face, and why in this crazy world of barbecue, they love this business so much. The final meal is a comparison of wrapped versus unwrapped briskets. At this point, we do not collect ballots any more to see who liked what. Most participants are facing “brisket fatigue” at this point, and are ready for something fairly light as they depart. We end Camp Brisket for this year and know that many people from all walks of life have come together to bond over barbecue in general, but with the common goal of how to tackle the challenge that is the brisket! This entry was posted in Camp Brisket and tagged Aaron Franklin, Bryan Bracewell, Courtney Boykin, Crystal Waters, Daniel Vaughn, Davey Griffin, Foodways Texas, Hannah Laird, Hickory, Hillary Henderson, Jeff Savell, Jennifer Willis, Jess Pryles, Katy Jo Nickelson, Kevin Kolman, Kyle Phillips, Leslie Frenzel, Madalynn Kainer, Marc Vogelsang, Mark Frenzel, Max Martinez, Mesquite, Micki Gooch, Nick Nickelson, Oak, Patrick Frenzel, Pecan, Pitt's & Spitt's, Ray Riley, Robb Walsh, Russell Roegels, Ryan Zboril, Stormy Joplin, Taylor Rowland, Wayne Mueller, Weber Smokey Mountain Cooker. Bookmark the permalink. Thanks to everyone involved for your passion and dedication – we had an amazing time!! Take a look at select images from the Texas A&M BBQ Genius Counter at the Texas Monthly BBQ Festival.